The head is impressive without being heavy. Its beauty lies in a combination of strength and refinement. It is important that its size and proportion be in balance with the rest of the dog. Viewed in profile, the head appears approximately the same length as the neck and blends with the body in substance. The stop, eyebrows and chiseling of the bony structure around the eye sockets contribute to the Springer's beautiful and characteristic expression, which is alert, kindly and trusting. The eyes, more than any other feature, are the essence of the Springer's appeal. Correct size, shape, placement and color influence expression and attractiveness. The eyes are of medium size and oval in shape, set rather well-apart and fairly deep in their sockets. The color of the iris harmonizes with the color of the coat, preferably dark hazel in the liver and white dogs and black or deep brown in the black and white dogs. Eyerims are fully pigmented and match the coat in color. Lids are tight with little or no haw showing. Eyes that are small, round or protruding, as well as eyes that are yellow or brassy in color, are highly undesirable. Ears are long and fairly wide, hanging close to the cheeks with no tendency to stand up or out. The ear leather is thin and approximately long enough to reach the tip of the nose. Correct ear set is on a level with the eye and not too far back on the skull. The skull is medium-length and fairly broad, flat on top and slightly rounded at the sides and back. The occiput bone is inconspicuous. As the skull rises from the foreface, it makes a stop, divided by a groove, or fluting, between the eyes. The groove disappears as it reaches the middle of the forehead. The amount of stop is moderate. It must not be a pronounced feature; rather it is a subtle rise where the muzzle joins the upper head. It is emphasized by the groove and by the position and shape of the eyebrows, which are well-developed. The muzzle is approximately the same length as the skull and one half the width of the skull. Viewed in profile, the toplines of the skull and muzzle lie in approximately parallel planes. The nasal bone is straight, with no inclination downward toward the tip of the nose, the latter giving an undesirable downfaced look. Neither is the nasal bone concave, resulting in a "dish-faced" profile; nor convex, giving the dog a Roman nose. The cheeks are flat, and the face is well-chiseled under the eyes. Jaws are of sufficient length to allow the dog to carry game easily: fairly square, lean and strong. The upper lips come down full and rather square to cover the line of the lower jaw, however, the lips are never pendulous or exaggerated. The nose is fully-pigmented, liver or black in color, depending on the color of the coat. The nostrils are wellopened and broad. Teeth are strong, clean, of good size and ideally meet in a close scissors bite. An even bite or one or two incisors slightly out of line are minor faults. Undershot, overshot and wry jaws are serious faults and are to be severely penalized. Click Here to Learn about breeder background checks on English Springer Spaniel breeders if you are looking for English Springer Spaniel puppies for sale. Click Here to learn how ResearchBreeder.com can help you find healthy English Springer Spaniel puppies for sale. Click Here to order a Breeder or Kennel Background Check on English Springer Spaniel Breeders that may have English Springer Spaniel puppies for sale. 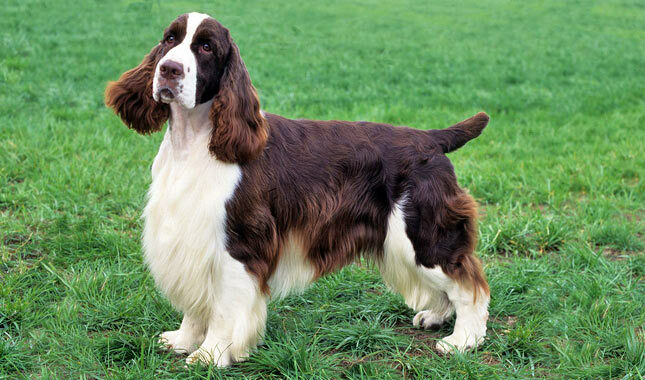 Click here to find the national breed club for English Springer Spaniel puppies for sale. Click Here to purchase a list of approved ResearchBreeder.com English Springer Spaniel Breeders who have English Springer Spaniel puppies for sale.